Background/Objective: Esophageal cancer has a peculiar geographical distribution and shows marked differences in incidence within a particular geographical region. Presently, as there seems little prospect of early detection of this cancer, an understanding of the etiological factors may suggest opportunities for its primary prevention. In this paper, we have tried to determine the role of diet and other life-style related factors in the etiology of cancer of esophagus. Material and Methods: A total of 100 confirmed squamous cell carcinoma of esophagus patients were enrolled for the study (Group A). 100 healthy subjects were included as controls (Group B). A predesigned questionnaire dealing with the basic patient data, dietary and smoking habits etc. was distributed among the cases in both groups. The data was thoroughly analyzed to define an association with the development of cancer of esophagus. Results: Group A patients included 71 males and 29 females in the age range of 40-70 years. Majority 37% were farmers, 29% house wives. Of the 72% smokers, 66% smoked hookah. 29% had positive family history. More than 90% took salt-tea at breakfast. Meat consumption was low, 44% took it weekly and 42% on monthly basis. 69% took fish yearly. Group B included 75 males and 25 females of which 35.7% were hookah smokers. Conclusion: Poor socio-economic status resulting in fewer intakes of fresh fruits, vegetables and fish in addition to heavy hookah smoking are suspected to be the major risk factors for the development of esophageal cancer. Cancer is a major concern in all nations of the world. About 10 million people are diagnosed with cancer and more than 60% die of this disease every year. Cancer is emerging as one of the leading causes of death in India. Despite recent advances in cancer therapy, esophageal cancer remains one of the least treatment- responsive malignancies. Even in developed countries, more than 85% of patients die within two years of diagnosis making it the sixth most common cause of cancer-related deaths in the world. High incidence of cancer of esophagus has been reported from Caspian littoral of Iran, central and East Asia and certain areas of china. , In India, esophageal cancer is the most common malignancy involving the gastrointestinal tract in Karnataka, Tamil Nadu, Kerala and Assam. In Kashmir, esophageal cancer is ranking at number one. There is scarcity of epidemiological studies in this malignancy. Since, the prognosis in esophageal carcinoma is extremely poor and as there seems to be little prospect for early detection or treatment, a better understanding of the etiology/risk factors may suggest opportunity for its primary prevention. With this idea, we have conducted a prospective study to identify the risk factors that may have a role in the development of this cancer in our region. Between January and December 2008, a prospective study including 100 patients of esophageal cancer (Group A) was carried out in a tertiary care institution in Northern India. One hundred healthy subjects were included as control (Group B). In both Group A and Group B, equal number of cases was selected from rural, urban and semi-urban areas. Group A patients had histopathologically confirmed squamous cell carcinoma of esophagus. Patients with histopathology of adenocarcinoma and with lesions of gastro-esophageal junction were excluded. A predesigned questionnaire covering personal, occupational, dietary and family history was distributed amongst all the cases who consented to answer the same. All the variables of the questionnaire were analyzed and conclusions were drawn accordingly. During the year 2008, 2405 patients of various malignancies were registered in the Department. Among these, 409 cases (17.03%) had esophageal cancer. One hundred cases with mid esophageal involvement and histopathology of squamous cell carcinoma were included in the study group comprising 71 male and 29 female cases with a male: female ratio of 2.4:1. Mean age was 54.3 ± 7.6 years (range 40-70 years). An equal number of healthy subjects in Group B comprising 75 male and 25 female cases with a male: female ratio of 3:1 and mean age of 58.1 ± 8.3 years (range 38-76 years). In Group A, majority of patients were farmers and house wives, 37 and 29% respectively. In Group B, majority were non-gazetted government employees and middle class businessmen, 44 and 24% respectively [Table 1]. Patients in Group A mostly belonged to low socio-economic status with 20% literacy level of high class and above. In Group B, literacy level of high class and above was seen in 70% cases. Over 80% of patients belonged to rural areas in both the groups. In Group A, 29% cases had positive family history of esophageal carcinoma with one/more members' death related with esophageal carcinoma. In Group B, 25% cases had family history of cancer related death [not necessarily due to esophageal cancer] [Table 1]. In Group A, there were 72 smokers with hookah smoking being the major mode of smoking in 91.7% cases while as in the control group there were 42 smokers of which 35.7% were hookah smokers. In Group A, 78.8% patients smoked more than 20 g of tobacco/day while as none of the cases in Group-B smoked more than 20 g of tobacco/day. [Table 1] Salted tea (noon chai) and homemade or backed bread was the breakfast for both the groups. Seventy six (76) and 90 cases consumed less than five cups /day in Group A and Group B respectively. More than five cups/day were consumed by 24 and 10% in Group A and Group B respectively [Table 2]. In addition to salty tea, 20% also took black tea; three-five cups/day in both the groups. Luke warm tea was consumed by 72 and 77% cases in Group A and Group B respectively. Rice was the staple diet in both the groups. Fresh green vegetables were consumed by all our cases in both the groups; however, over 90% cases in both the groups used to take a leafy green vegetable of brassica family popularly known as "Haakh" daily in addition to other vegetables. Sun dried vegetables were consumed by 20 and 30% cases during the winter season only (that too occasionally) in Group A and Group B respectively. Forty-five percent of our patients in Group A consumed fruits monthly; 40% took these on weekly basis and none used to take these on daily basis while 45% used to take fruits weekly and 7% on daily basis in Group B. Meat was consumed by 44 , 42 and 14% patients on weekly, monthly and six monthly basis in Group A and 69%,15% cases consumed meat on weekly and daily basis respectively in Group B. Fried fish (not the smoked fish) was consumed by 69 and 31% twice or thrice a year in Group A and Group B respectively [Table 2]. None of the cases in either group took fish on daily basis and none of our cases consumed alcohol or chewed tobacco in both the groups. Our observations in this geographical region of high incidence suggest and strongly suspect poor socio-economic status to be a major risk factor for the development of esophageal cancer as this population has limited access to different varieties of fresh fruits and vegetables. Occupational exposure and smoking, particularly the hookah smoking, are the contributory factors. The most feasible method to reduce this cancer burden is to identify and target etiological factors, improve socio-economic status, screen the high risk group of people (positive family history), and finally to develop strategies for prevention. 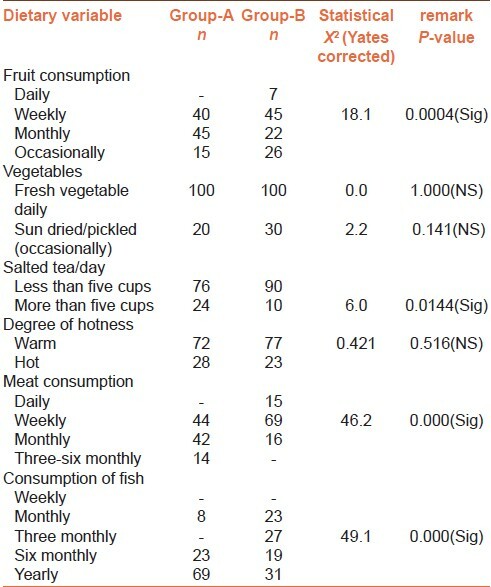 An association of less consumption of meat and fish observed in our cohort of patients needs further evaluation. 1. Khanna P, Singh A, Kaushal V. Smoking and cancer. Radiation Oncology 2005;5:12-17. 2. Kamangar F, Malekzadeh R, Dawsey SM, Saidi F.et al Esophageal cancer in North Eastern Iran: A review. Arch Iran Med 2007;10:70-82. 3. Khuroo MS, Zargar SA, Mahajan R, Banday MA. High incidence of oesophageal and gastric cancer in Kashmir in a population with special personal and dietary habits. Gut 1992;33:11-15. 4. Chitra S, Ashok L, Anand L, Srinivasan V, Jaynath V. Risk factors for oesophageal cancer in Coimbatore;SouthernIndia;A hospital basesd care control study. Indian J Gastroenterology 2004;23:19-21. 5. Khan NA, Lone MM, Fir Afroz, Kharadi MY. Clinico-pathological profile of carcinoma oesophagus and esophago-gastric junction in Kashmir. JK Practitioner 2004;11:182-5. 6. Desai BP, Borges JE, Vohra GV. Carcinoma of esophagus in India. Indian J Gastroenterology 1997;16:98-101. 7. Malkan G, Mohandas KM. Epidemiology of digestive tract cancers in India. Gut 1997;16:98-101. 8. Malhotra SL. Geographical distribution of gastrointestinal cancers in India with special reference to causation. Gut 1967;8:376-72. 9. Ansari MM, Haleem S, Beg MH. Clinicopathological profile of carcinoma esophagus at Aligarh. J Indian Med Assoc 1991;89:217-19. 10. Farin K, Graca MD, William FA. Patterns of cancer incidence,mortality and prevalence across five continents: Defining priorities to reduce cancer disparities in different geographic regions of the world. J Clin Oncol 2006;24:2137-50. 11. Sankaranarayanan R, Duffy SV, Padma Kumaray G, Nair SM, Day NE, Pandanabhan TK. Risk factors for cancer of the esophagus in Kerala, India. Ind J cancer 1991;49:485-89. 12. Saeki H, Ohno S, Araki K, Egashira A, Kawaguchi H, Ikeda Y, et al. Alcohol consumption and cigarette smoking in relation to high frequency of P53 protein accumulation in esophageal squamous cell carcinoma in Japanese. Br J cancer 2000;82:1892-94. 13. David J, Adlestein MD, Walter B, Forman MD, Barbara B. Esophageal carcinoma;A six year review of the Cleveland Veterans Adminstration Hospital experience. Cancer 1984;54:918-23. 14. Galeone C, Pelucchi C, Levi F, Negri E, Talamini R, Franceschi S, La Vecchia C. Foliate intake and squamous cell carcinoma of the esophagus in Italian and Swiss men. Ann Oncol 2006;17:521-24. 15. Dwight TJ, Douglas T, Luis RV, Peter G, Sherry C, Cathy T. Lung cancer and exposure to tobacco smoke in the household. New Eng. J Med 1990;323:632-36. 16. Parviz G. Thermal irritation and esophageal cancer in Northern Iran. Cancer 1937; 60:1909-14. 17. Bhurgri Y, Faridi N, Kazi LAG, Ari SK, Bhurgri H, Ahmad R. Cancer esophagus in Karachi 1995-2000 epidemiology. Risk factors and trends Pak Med Asso; 2004. p. 345-52. 18. Nayer D, Kapil U, Joshi YK, Sudaram KR ,Srivastava SP, Shukla NR, et al. Nutritional risk factors in esophageal cancer. J Asso Physicians India 2000;48:731-47. 19. Nandakumar A, Anantha N, Pattabhiraman V. Importance of anatomical subsite in correlating risk factors in cancer of the esophagus:Report of a case control study. Br J Cancer 1996;73:1306-11. 20. Siddiqui M, Kumar R, Fazali Z, Spiegelhaldar B, Preussmann R. Increased exposure to dietary amines and nitrates in a population at high risk of esophageal and gastric cancer in Kashmir(India). Carcinogenesis 1992;13:35. 21. Siddiqui M, Precussmann R. Esophageal cancer in Kashmir: An assessment. J Cancer Res Clin Oncol 1989;115:111-17. 22. Castellsague X, Munoz N, De Stefani E, Victora CG, Castelletto R, Rolon PA. Influence of mat drinking, hot beverages and diet on esophageal cancer risk in South America. Int J Cancer 2000;88:658-64. 23. Ray A. Cancer-preventive role of selective dietary factors. Ind J Cancer 2005;42:15-22. 24. Hildebrandt MA, Yang H, Hung. Genetic Variations in the P13K/PTEN/AKT/mTOR pathways are associated with clinical outcomes in esophageal cancer patients treated with chemo-radiotherapy. J Clin Oncol 2009;27:857-71. 2 Hookah, is it really harmless? 3 Do tumor location and grade affect survival in pT2N0M0 esophageal squamous cell carcinoma? 8 Do tumor location and grade affect survival in pT2N0M0 esophageal squamous cell carcinoma? Situ, D. and Wang, J. and Lin, P. and Long, H. and Zhang, L. and Rong, T. and Ma, G.
Dar, N.A. and Islami, F. and Boffetta, P.
Pawar, H. and Maharudraiah, J. and Kashyap, M.K. and Sharma, J. and Srikanth, S.M. and Choudhary, R. and Chavan, S. and Sathe, G. and Manju, H.C. and Kumar, K.V.V. and Vijayakumar, M. and Sirdeshmukh, R. and Harsha, H.C. and Prasad, T.S.K. and Pandey, A. and Kumar, R.V. Situ, D. and Wei, W. and Lin, P. and Long, H. and Zhang, L. and Fu, J. and Rong, T. and Ma, G.
Dar, N.A. and Bhat, G.A. and Shah, I.A. and Iqbal, B. and Kakhdoomi, M.A. and Nisar, I. and Rafiq, R. and Iqbal, S.T. and Bhat, A.B. and Nabi, S. and Shah, S.A. and Shafi, R. and Masood, A. and Lone, M.M. and Zargar, S.A. and Najar, M.S. and Islami, F. and Boffetta, P.
Rasool, S. and Ganai, B.A. and Sameer, A.S. and Masood, A.